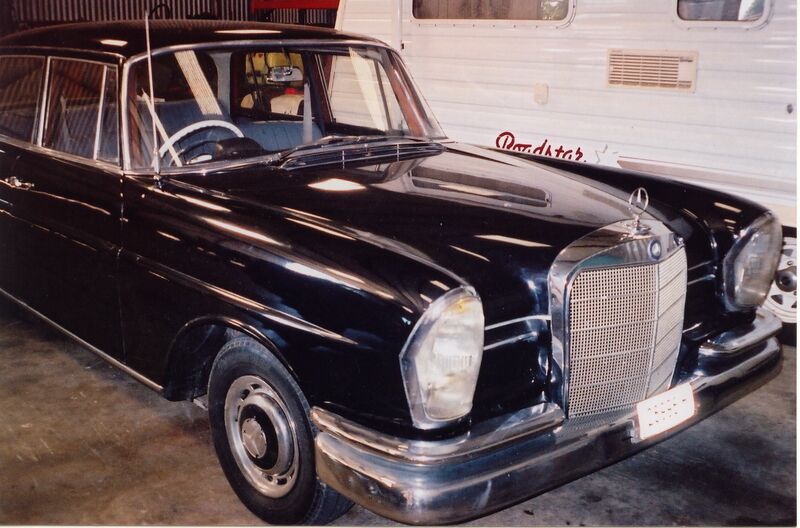 Mercedes 220SE “Fintail” – January 2005 – – Southern Tablelands Heritage Automotive Restorers Club Inc. Some two years ago I read the following article in “The A-Z of Cars” and I began my search for such a car. I finally found a black 220SE `finni’ in Downer ACT, parked under a tree in the backyard for the previous four years. The young man who I bought it from, had purchased it in running order but he had spent the last four years at an overseas posting and sold it to me on his return as he felt it was a too big a project to rejuvenate now. When I brought it home on the trailer Krystyna was not impressed!!! The car had a green mould on much of the outside bodywork and as one window had been left open the interior was a mess, and when I touched the seats the upholstery cracked. However, the car was in quite good condition mechanically. On stripping the carpet and seats I found the original log books, underneath the front seat mixed up with leaves! The engine and serial numbers checked out to be original and I discovered that the vehicle was delivered new on 12 November 1961 to the South African Embassy, Africa House Kingsway, London. The logbook shows that the vehicle was serviced by Epps Brothers, Green Street, Green, Orpington, Kent, England till end of 1962. 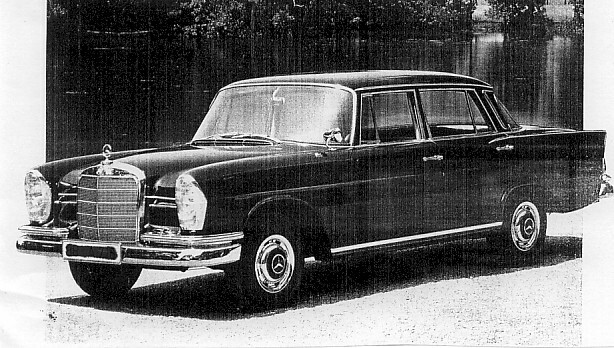 The car was then brought to Australia and the service booklet shows the 20,000 miles service was carried out by the local Canberra Mercedes dealer on 29 September 1964. The last logbook entry was dated 13 July 1973 when it had done 75,000 miles. I replaced the upholstery and carpets and I removed all the chrome knobs and handles and polished them with a fine wire brush, as they had an oxidized film on them. A complete new set of genuine door rubbers were obtained and now dust and water is repelled from the car. I cut and polished the body numerous times and the thick old black paint started to shine. There are still scratches and flaws in the bodywork but it looks good and original. Mechanically I replaced the exhaust system, brake linings, some suspension bushes and the water pump. The engine was in surprisingly good condition with even compressions and only a major tune-up including valve clearances was needed. The fuel injection system is unusual as it is a Bosch Mechanical twin piston, branching out to supply the six cylinders. Mercedes Benz only used this system for a short period and it is difficult to get information on the service and repair of it. The car starts well when it is cold, but most club members are aware of my starting problems when engine is hot. This is a pleasant old car to drive with a big steering wheel and a smooth four-speed-transmission. The responsive engine is willing to pull-down to 10mph in top gear without any fuss but it seems very happy to cruise along at 60mph.